After my recent upgrade to Parallels Desktop 4 I've run into yet another issue. Apparently upgrading from PD3 to PD4 introduces some minor changes to the networking setup, which causes OpenSolaris' ni interfaces to break. "Break" turns out to be a large word, but it's still an inconvenience. Apparently during the upgrade process the virtual PCI slots get shuffled a bit, leading to the ni1 interface getting renamed. Before the upgrade everything ran on interface ni0, which started complaining about problems right after the upgrade. svc.startd: svc:/network/physical:default: Method "/lib/svc/method/net-physical" failed with exit status 96. Checking the svcs output doesn't actually give me much hints aside from the fact that interface ni0 can actually not be found. Both prtdiag and prtconf seem to confirm this. I then checked the output of dmesg to see if there's anything useful in there. There was. And so on... This confirms that the ni driver and interface are working. It also tells me that there's an interface ni1. ni0 only gets mentioned when Solaris tries to actually start TCP/IP on ni0, which as has been said is not present. By typing "ifconfig ni1 plumb" I've confirmed that the network card is now in fact called ni1. During the upgrade to Parallels Desktop 4 the virtual PCI slots got shuffled, leading to a rename of the network interface. A bit over half a year after putting my Powermac G5 to bed I've actually gone and sold her. A new member at the MacFreak fora was interested in buying a cheap Mac to get his feet wet after living on Windows all his life. He'd tried Linux which wasn't "it" and now was curious about OS X. While the G5 is no powerhouse by today's standards it's still a very nice box for a beginner. G5 @1.6GHz with 1.5GB RAM and 200GB of hard drive space. I sold it for 220, which is a bit under the market price but it's definitely fair money for a six years old box. 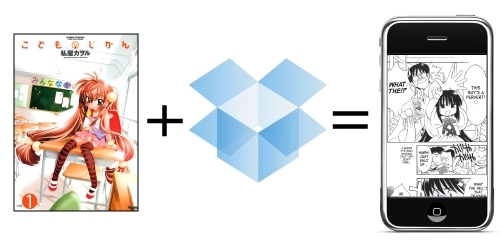 Dropbox made things a lot easier! I've been thinking of solutions to reading manga on the road, usually opting to just bring a pocket book or two. However, now that I've started using Dropbox life's gotten a bit easier. No more need for one of those eBook readers with electronic ink and such, because my iPhone screen is -just- big enough to comfortably read comics. Hooray for the Dropbox iPhone app which gives me access to my DB share everywhere I can have 3G Internet access. For those unaware what Dropbox is: it gives you 2GB of free online storage space which you can access from a web browser, an iPhone app, or using software for Mac, Windows or Linux. On the PC side of things your Dropbox will appear as a normal directory in your homedir. However, everything you put in that directory will automatically get synchronized to your online storage. This ensures that your files are accessible from all your computers and even when you're someplace else with a browser. Nice. Last week I finally got my mits on our OS X Snow Leopard install disc. After properly backing up my Macbook and disabling the guest acount (to ward off the horrible bug) the install went without a cinch. I fell asleep on the couch while it was running, but I reckon it didn't take more than half an hour. Anywho, afterwards (as expected) everything seemed exactly the same because just about all the changes took place under the hood. * Output from top for the six heaviest processes running. * IP address info for Ethernet, Wif and my Internet connection. 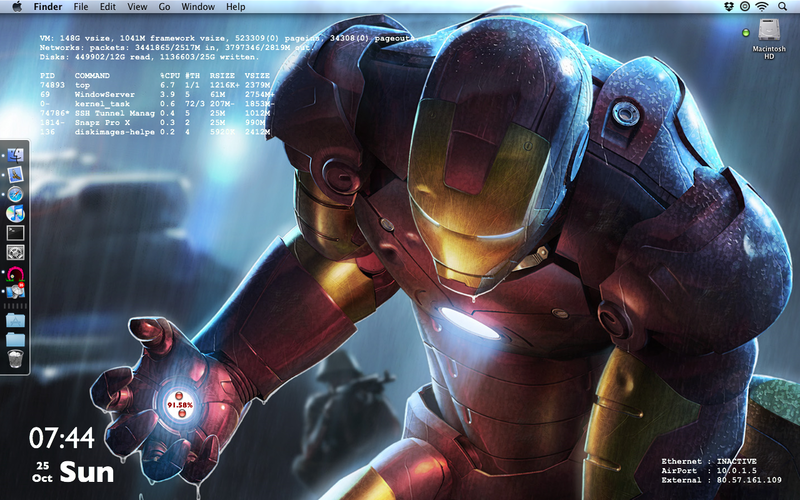 Also, here's the original file for the Iron Man background.